All 12 teams in the inaugural Hunter Centre RBC Fast Pitch Competition finals arrived bright-eyed early Friday morning; first place winners, Securelet, went home that afternoon with the grand prize of nearly $100,000 in cash and in-kind to realize their startup. The competition involves second-year Haskayne students enrolled in Entrepreneurial Thinking 317, and tasks them with researching and developing a sustainable new venture. The first-place team, Securelet, is a revolution in on-campus security. Their product combined fashion with function in a bracelet for women to wear on campus that has a button to call for help in case of an emergency. Second place was awarded to EcoSpire Plastics and Happy Hands scooped up the third place award. A surprise twist awarded One World Blankets as Viewer’s Choice which was determined by the audience. 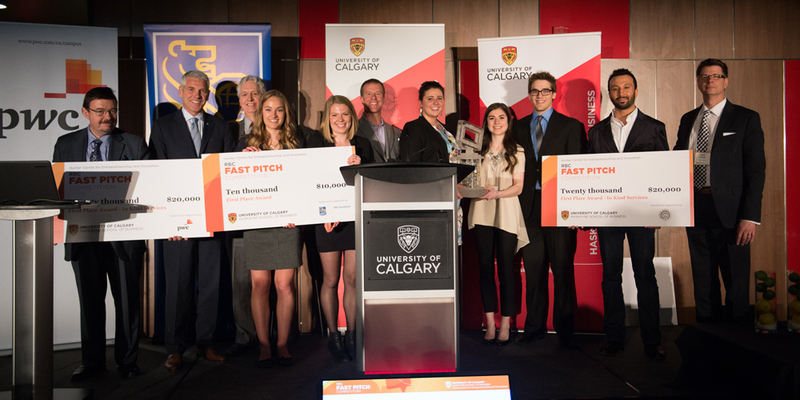 Teams were given ten minutes each to pitch their new venture idea to a panel of 12 judges who are prominent business leaders in Calgary. After the presentation, the judges were allotted four minutes to ask hard-pressing questions regarding the real-world functionality of their enterprise. The 12 RBC Fast PItch competition finalists, in the order they presented, were: Eco-LOGic, Happy Hands, One World Blankets, Peeach, Build-A-Bar, Lazer Lots, EcoSpire Plastics, Revitalize Scrubs, Campus Catering Company, Safety Dynamics, Securelet, and Little Feet.